Remind Your Patients to Use Their Insurance Benefits! The end of the year is coming which means many patients are at their deductibles or even their out-of-pocket max! This is a great opportunity for PT’s to reactivate past patients with little or no cost to them! When was the last time insurance companies helped you market? Well, now they are! We’ll craft easy-to-understand language and provide a fully custom design that has proven to engage past patients. All we need is your logo! Full-service direct mail is also available. Free mailing list cleanup + custom addressing service INCLUDED! Postage is only 28¢ per piece. Each year we help practices educate patients on how to use year-end insurance savings. Let us help you craft the perfect message! Our professional team of graphic designers match your practice’s colors & brand ensuring your practice keeps a professional image. Don’t have a logo? We can help with that too! We'll help you optimize your past patient mailing list, uniquely address each individual card, and send them straight to your patients! USPS postage of 28¢ each is the only extra cost. Need a Higher Quantity? Call 800-594-7656! Want to help your patients get mostly or fully covered PT care they desperately need? Let them know how! 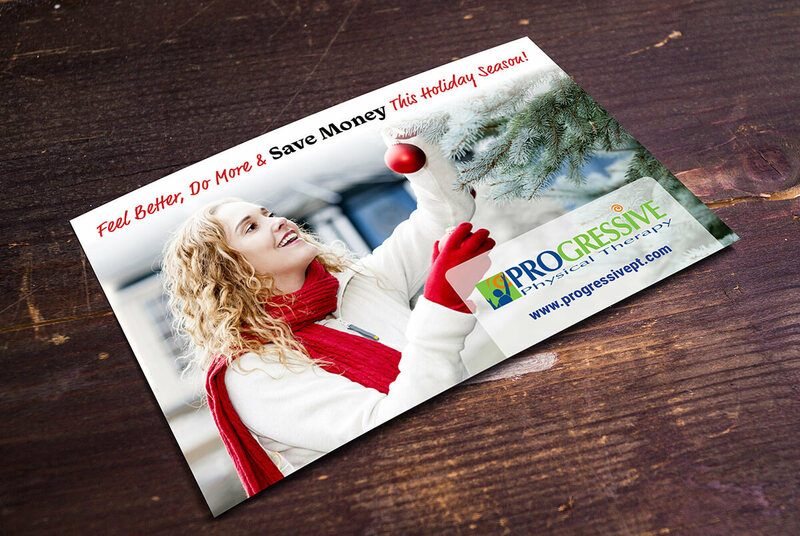 It’s easy with our Patient Insurance Benefit Reminder postcards. Order today and we’ll get started on your design!